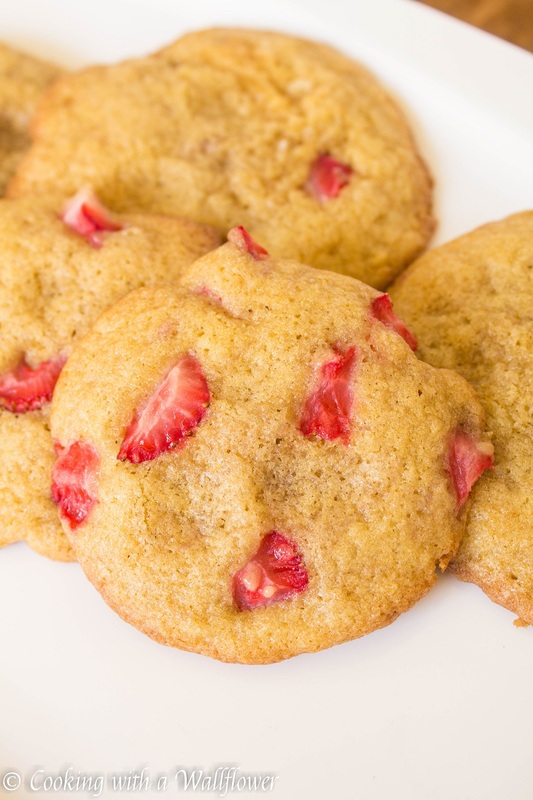 Fresh strawberries baked into brown sugar vanilla cookies. These strawberry cookies are crispy on the edges and chewy in the center with a seasonal twist. Oh, hi, you, beautiful strawberries. It’s strawberry season (!) and I’m in love. I mean, how can you resist sweet juicy berries? Unless you’re allergic, of course. When it hits spring and summer, strawberries tend to make their way into all my dishes. From salads to dessert to beverages, they’ve made, and will make, an appearance and oftentimes take center stage. I went to the Farmer’s Market yesterday after a half work day, and there’s soo many berries. But what I really want to do is go strawberry picking, actually, berry picking in general. How much fresher can berries get, right? Now, I’m researching places to do it in the Bay Area in either June or July. Any suggestions? Now, these cookies, OMG, these cookies! I’ve been making a few batches in recent weeks to “test” them out. But the truth is, I really wanted another taste. Can you blame me? They’re filled with fresh strawberries! And these cookies are just perfect. To me, at least. Because everyone has their personal favorite, whether they’re soft, hard, or chewy. Me? I like my cookies with that crispy golden brown edges and a soft and chewy center. 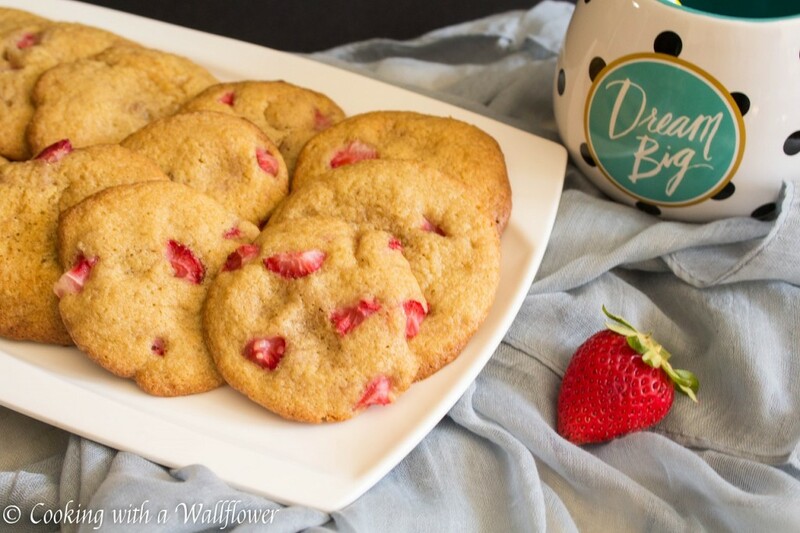 To create these strawberry cookies, you just need the basic ingredients and steps. In a medium sized bowl, mix together flour, baking powder, baking soda, and salt. These are the dry ingredients. Set aside for now. 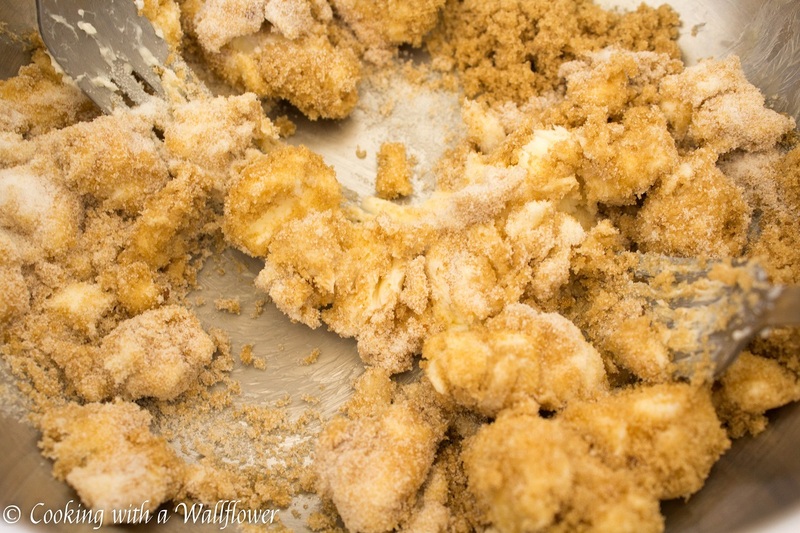 In a large bowl, mix together butter, brown sugar, and granulated sugar until they are evenly incorporated. Add a beaten egg and yolk and vanilla extract. Mix the ingredients until they well incorporated. These are the wet ingredients. Add the dry ingredients to the wet ingredients. Mix them together until they form dough. 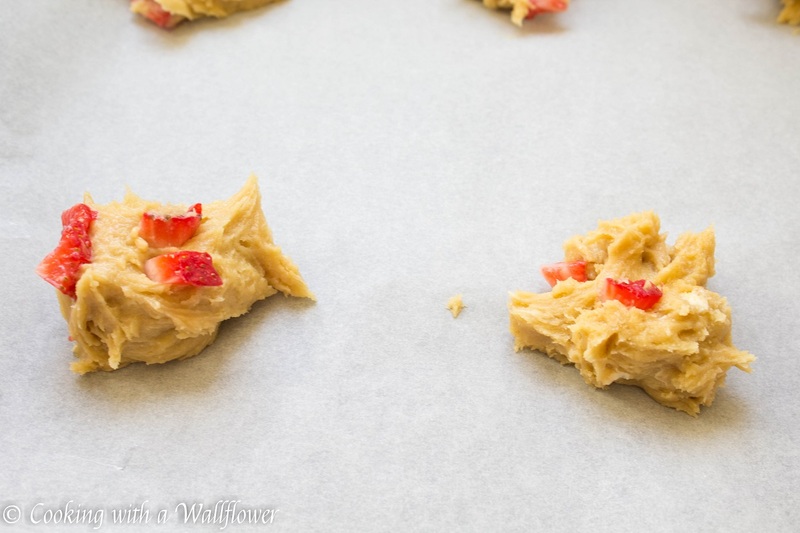 Lastly, add the diced strawberries and fold them into the dough. You don’t want to over mix them because the strawberries can become mashed in the process. But you might want to save a few to top your dough balls. Otherwise, your cookies will lack that bright redness. See my cookies below. Look at the cookies behind the one I’m featuring. See? Refrigerate the dough for about a half hour. The reason for this is because the strawberries make the dough wet. The more wet the dough, the more your cookies spread. Which is fine if you prefer flatter and crispier cookies (sometimes I do) or if you just can’t wait to eat them (the case for me). If you refrigerate your dough, the cookies will spread less. Break the dough into small sized balls and place them on the baking sheet. Bake them for about 10-13 minutes until the edges are golden brown. Just remember, every oven is different and you know your oven best. Plus, once you remove the cookies from the oven, the cookies will continue to bake on the hot baking sheet. Come join me and other food bloggers at Fiesta Friday! Preheat the oven to 350F. Line a baking sheet with parchment paper. Set aside for now. In a medium sized bowl, combine the flour, baking soda, baking powder, and salt. These are the dry ingredients. In a large bowl, beat together the butter, brown sugar, and granulated sugar until they appear creamy. Add the beaten egg and yolk and the vanilla extract. Mix until they are evenly incorporated. Slowly stir in the dry ingredients and mix until they are well combined and form batter. Fold in the diced strawberries. Cover the dough and refrigerate for at least a half hour to allow the dough to become firmer. Refrigerate for longer if needed. Break the dough and roll them into balls. You’ll have about 15-18 cookies depending on how big you roll your dough. Bake the cookies for 10-13 minutes until the edges are golden brown. Remove the cookies from the oven and allow them to cool on the baking sheet for 5 minutes before transferring them to a wire rack. 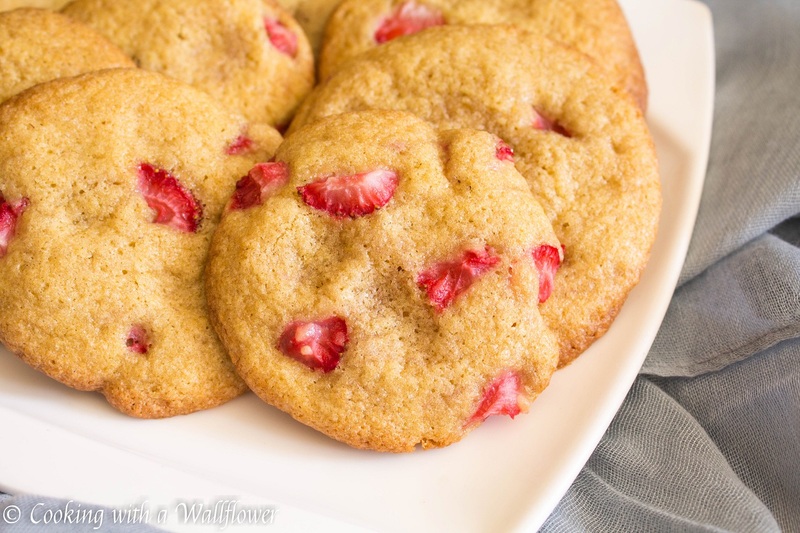 This entry was posted in Cookies, Desserts, Quick and Easy, Recipes, Spring Cravings, Strawberries, Summer Cravings and tagged cookies, dessert, quick and easy, seasonal, strawberries. Can I add vanilla pudding mix? And if so,I would have to add more butter or egg? I haven’t used vanilla pudding mix so I’m not sure how that would affect this recipe. Let me know if you decide to use the pudding mix and how it turns out! Yes, you can drop them by the spoonful. Hope that helps. I might make these this weekend! Thanks for sharing! I made these yesterday. So delicious. I used dehydrated strawberries since town is so far away and its winter. I re-hydrated them. I’m going to have to double the recipe next time. Thanks! I’m so glad you like it, Sarah! I added a little extra butter, and frozen strawberries instead. It made a delicious cake! My daughter and I made these yesterday and they were delicious! 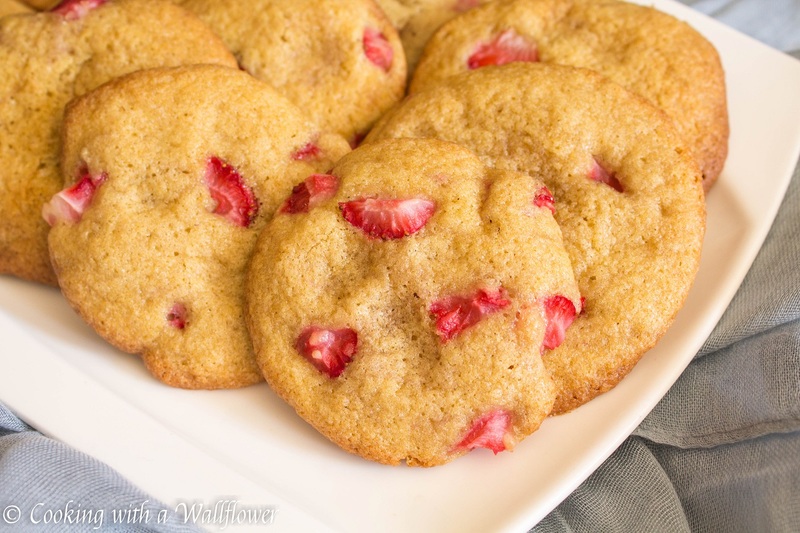 I would have never thought to put strawberries in a cookie, but then my 5 year old suggested “strawberry cookies” and I found your recipe. They turned out just like your picture. We took them on a picnic and the whole family approved!